...because cents add up to dollars! Cellfire is running a great promo today until 8PM CST! This should give you plenty of time to get your free money coupon loaded to your Kroger (or affiliate) shopper card. 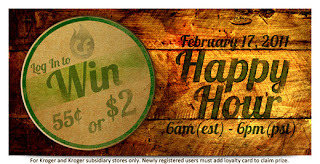 Just log in (or sign up & register your Kroger card), browse your Kroger offers, and save the promo coupon to your card! Easy! Log in now to see if you won $.55 or $2! I won $2 today! YEA! What did you win?